This page starts by showing the instillation from the start of a new row and how the floor heater vent is handled. It also shows the edgework in doorways. In this picture the first rows of laminate have been placed and he is finishing out the last row which is against the fireplace base. There are two things you should notice in this picture. One is the way the laminate has been cut to match the curve of the fireplace base. 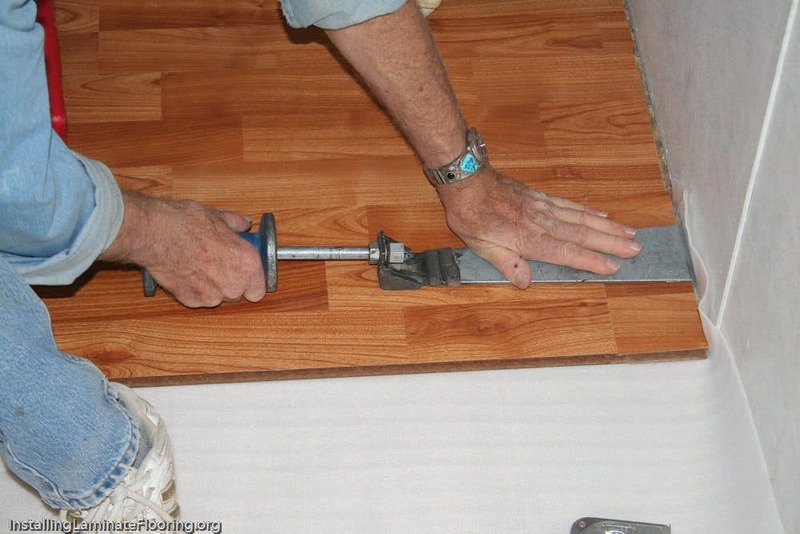 The other is the way the ends of the two rows of wood strips are not cut to the same length. You always want a foot or so off set on the ends of the strips. In this picture the cut piece has been snapped into pace and you can see the expansion space left on the right side. The next row strip is fitted into place and “hammer” is being used to drive it tight against the end of the strip to the left. You can see how handy the tapping block is in this situation; a regular hammer alone wouldn’t work so well. There needs to be an expansion area around the fireplace edge too. Hammering the strips together as shown in the previous picture moved the strips to close to the base. The tool is helpful in pulling it back where it should be.